I am struggling to write a new post. Well, my first class at Whole Foods last week was monumental. I had been busy with the preparation for this class for the past four months. And when I was finally teaching to a room full of food enthusiasts, the whole scenario felt surreal. Yes, I am happy to report that my first class was indeed a blast! I wanted to tell you right away immediately after the class. But I guess I was too excited, as I suffered from writer's block. I stare at my screen and I struggle to find the right words. And so it has been like this for almost a week. However, this morning I found a message from an old friend, Olive. She mentioned she started reading my blog. She expressed how she was inspired by it. As if bitten by a bug, she has been promoting my blog and FB page non-stop for the last 24 hours. Ferdie, a relative and a schoolmate from high school, was surprised to learn that I write this blog. We had a short chat this morning and he was excited to read my posts and shared his appreciation online. He loves to cook and is all the more inspired because of my blog. I sit down here and I realize that their words of appreciation inspire me. Their kind words, along with the others who comment and share their compliments, inspire me to continue writing. Yes they may be unaware but it is because of friends like them and their kind words that fuel me to move on. You, my readers, are the reason why I sit here and continue to write. I am all of a sudden so inspired! Drop the cabbage rolls in a pot of boiling water seasoned with salt (addendum as I just got a tip from my friend Cherrylyn to add a tsp of baking soda in the pot of water too. This will make your cabbage look nice and green) Cook until the leaves are pliable. This usually takes 3 minutes. Drain and set aside. Mix all the ingredients of the filling together. Divide the filling into 12 portions. 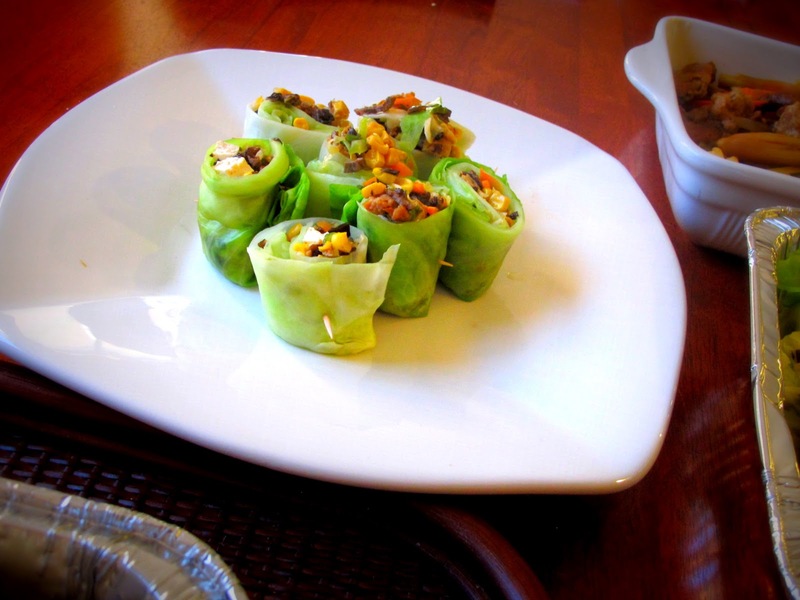 Place the filling on each cabbage leaves and roll. Fasten the roll with a toothpick. Poach the rolls on the same pot of boiling water. In a small bowl, mix the fish sauce, water, lime juice, garlic, sugar, chili sauce, hoisin sauce and chopped peanuts together. Serve the rolls with the sauce on the side. 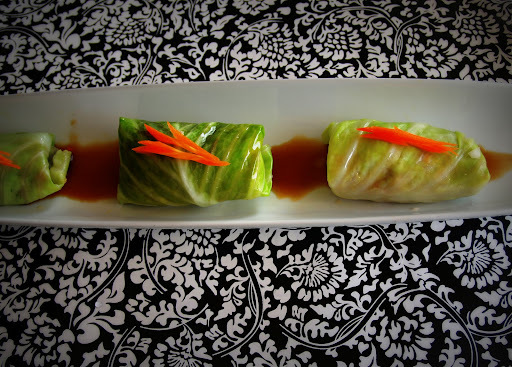 An Asian inspired cabbage roll!! I love all the flavors. Reminds me of my mom and her cooking growing up. I will have to make these for her to try. Welcome back!! Your pictures are calling my name. Are you sure you are not coming back here in Cali? I miss you. i don't think i'm visiting anytime soon joyce but if ever i will i will definitely give you a call. I know, don't we all need it from time to time? Im glad cabbage is also in your food repertoire. This is delish, Malou! Must try this. And your friends are right. You're very inspiring. Thanks for generously sharing your gifts with us ! thank you for the sweet words. They truly come in handy! you should try the polish version as well :) it's called gołąbki and it's delicious. And my dream is to go for a cooking classes. thank you for the info. Sure I'd love to try the Polish version. If you live here in STL, I hope you could come to my next class. Congratulations on your successful class!!!! wish I could be there, I'm still on vacation mode. Looks yum this one, we love, love lettuce wraps and we always order it wherever we go when available, I guess, this probably comes close to that too! I love this recipe! 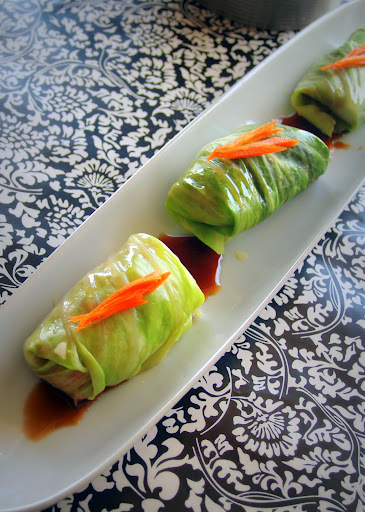 Cabbage rolls are often kinda mediocre, but this one has wonderful flavors. Much more interesting than what I usually see. Glad your class went well, and that you're over your writer's block! We have or little cooking demonstrations as well, done in our favorite famous Publix supermarkets, but they are done by their employees, and they promote their own recipes connect with their promotional company that has the recipes, and also video demonstrations. Our Whole Foods market also has people promoting their own product to do cooking demos...I guess each Whole Foods is run a different way! I would love to see a video of your talented cooking lesson, Malou; I'm sure you are a pro at this! 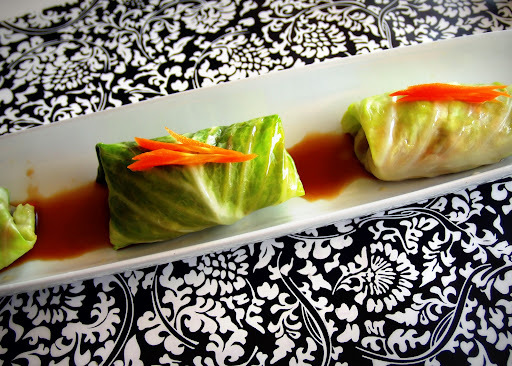 Love your yummy Asian cabbage rolls, every nationality has their own take on it! Bookmarking your recipe, and thanks for sharing, my dear friend! How long did you poach the rolls? I made these last night and poached them for 6 minutes each. I felt like that was long enough, but upon cutting into them, found them a little too pink to eat still. I ended up putting them in a casserole dish and putting them in the oven for a bit. I cooked it for more than 20 minutes. I also pricked one of the rolls and when the liquid that came out is clear, then the meat is cooked. I am so sorry that your cabbage rolls didn't turn out ok and I thank you for letting me know.